I made a trip down to the Fifth Ward of Houston on Friday. No offense to the people who live there, or who are from there, but the “Five Spot” is not my normal stomping ground; it is a long way from Tomball…but I was pulled there, to the point where I continuously asked my wife if I should go and she suggested I answer the call. From a material perspective, all I received for the trip was a card, the image of which is posted here. But the visit was worth a whole lot more to me. 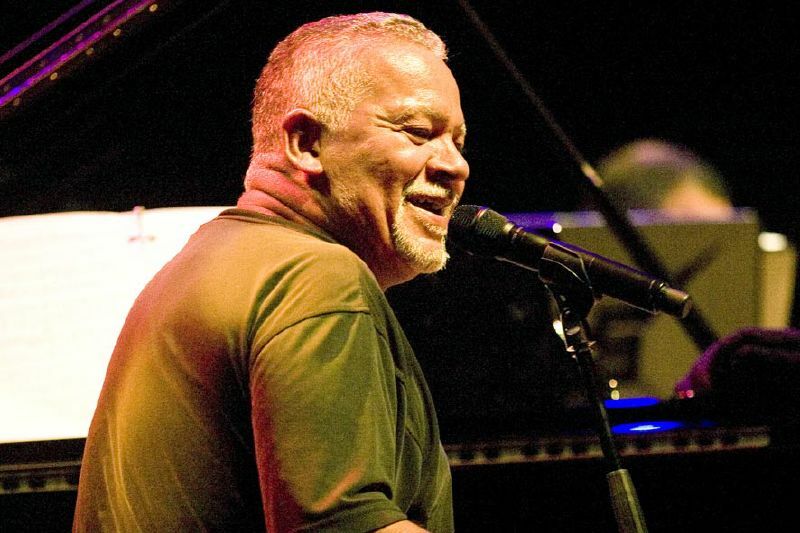 Joe Sample passed away on September 12, and Friday night was his visitation, open to the public, a categorization for which I qualified; I don’t know his wife Yolanda, or his son Nick (though I’ve seen him play bass several times). And I only spoke to Joe once, in passing after a show, saying the normal words one says to a performer you don’t “know” but whose performance has been a part of your life. People are hit with a lot of that these days, feeling like they get close to a particular performer through one or many of the social and digital media channels which provide an artificial sense of intimacy. Robin Williams comes to mind. But music is different; the intimacy and the sharing isn’t artificial…especially if it hits you the right way, at the right time. Joe first hit me with his album “Old Places, Old Faces.” And yes, kids, I mean album, the kind that earn scratches and pops through wear and use. I wore out that album, to the point where my two fave tracks – “Black and White” and “Hippies on a Corner” both had slight scratches in them. I never realized I “needed” digital music until this album came out on CD, so I could once again listen to it the way Joe intended it. I was privileged to see Joe in concert several times, solo, with the Crusaders and with Lalah Hathaway as a guest. My favorite concert was when he played at the Hobby Center as part of Houston Homegrown 3G; he was on the stage solo for a while, then with flutist Hubert Laws (who I believe was in his same high school class), then solo again; it wasn’t a highly advertised appearance, but it was one of the most enjoyable performances I’ve seen. I always enjoyed the story he told as he intro’d “Hippies on the Corner” talking about walking along Haight Asbury and being surprised by white “hippie flower children” slinging racial slurs his way. I have no doubt that Joe, growing up in Houston’s Fifth Ward in the 40s and 50s, had heard his share of these racial slurs before. Joe attended Phyllis Wheatley High School and then Texas Southern University, staying close to his roots, leaving only to head to LA with The Jazz Crusaders, the band he founded with fellow school mates (some say gents he’d known in middle school). After finding some success, he moved back to the Houston area. Which is why, last Friday night, I found myself at Our Mother of Mercy Church on Sumpter Street in the heart of the Fifth Ward. The Fifth Ward, from accounts I’ve read (which talk about poverty, high concentrations of felons, and other relator marketing nightmares), is not as bad as it used to be but as I drove by multiple run-down houses making my way to the church, I couldn’t help but wonder how this area had influenced a boy of five to take up the piano, and turn himself into the great jazz pianist and composer that he was. The answer wasn’t hard to find: Sample was influenced early on by the “la la music”, a pre-cursor to what is today called Zydeco, that his mother and father listened to. One of the performances I missed was after Joe taught himself to play accordion (very late in life) and started playing zydeco as the “Zydeco Joe” band, with his son Nicklas on bass. As I walked into the Church, several members of Phi Beta Sigma, which I learned was Joe’s fraternity, were milling in the front entrance way, getting ready to speak – some nervous, some joking to hide the nervousness, but all friendly, not just to each other but to me as I walked in. There was a viewing line which, after a moment’s hesitation, I queued into. I’m not big on viewings, not even with people I know. One of the speakers later in the service related a conversation he had with Joe, while he was sick and in his later days. He asked Joe how he was doing, and Joe replied, “I’m fine, always fine. I found my purpose in life early on, and that makes it easy.” I assume that means starting to play the piano at five years old, loving music and devoting one’s life to it. I think that’s what that trademark smile meant. I walked past Joe, past his wife Yolanda who was with someone she’d obviously known for years. Joe’s son and bandmate Nicklas was standing, looking at me like anyone would who is most likely sad, stressed, and wondering who this character is walking up to him. We both put out are hands to shake, me saying the usual “I’m sorry for your loss” and him responding “Thank you for coming,” like he probably had 100 times that evening. And then I said “Your daddy’s music was inspirational, to me and many others.” Nicklas flashed that trademark smile himself, and said thanks. Acorns never fall far from the trees. Nicklas’ professional biography (one as part of the Coryell Auger Sample trio) says “Forty years of experience in the music business is an unprecedented amount of information to gain in just the few years Nicklas has been working with his father. “Joe Sample is the best teacher I could ever have. I’m learning from the best”. I haven’t heard much of Nicklas’ trio’s music, but I like this track, called “Beautiful.” I will seek out more. As for the visitation, the Phi Beta Sigma brothers spoke about Joe, with one singing a hymn acapella so loud and clear that I’m sure my wife heard him back in Tomball. There were several proclamations from TSU, from the US Gov courtesy of Sheila Jackson Lee, and from many others. Thanks very much to Nicklas and Yolanda for opening the visitation to the public, and my thoughts are with you. And thanks to Joe, for the music. Below is a video of “Hippies on a Corner.” You can see that trademark smile at the end.